Once the import is complete, you will be able to verify that the purchase order has been created in Sage 300 by going into Purchase orders as you normally would. Once the import is complete, you will be able to verify that the transfer has been created in Sage 300 by going into Transfers as you normally would. 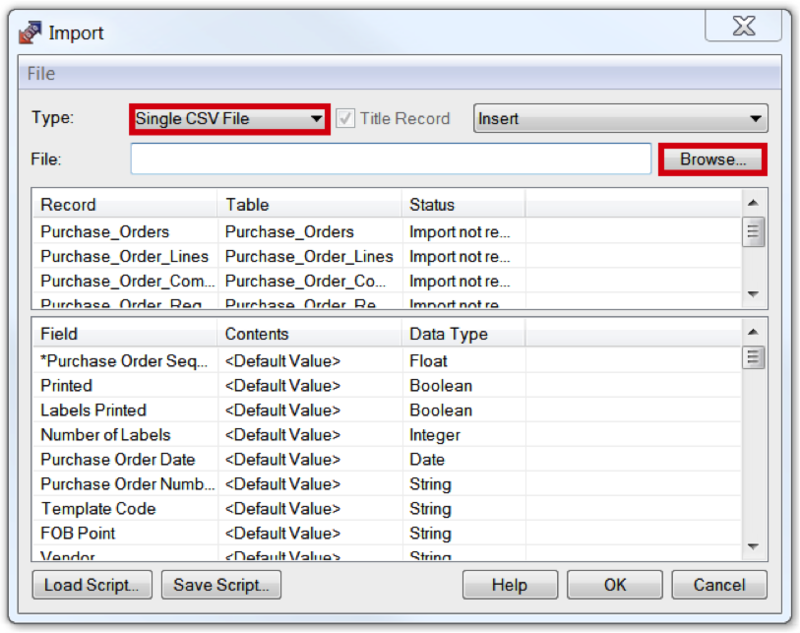 RECTYPE Character indicating the Purchase order Header Line. Default to an 1. PORHSEQ Sage 300 generated unique order reference number. Default to 0. Not double quoted. DATE Date the purchase order was created as shown in the PO summary YYYYMMDD FORMAT. Not double quoted. VDCODE Vendor code (not description) of the supplier as displayed in the PO summary. EXPARRIVAL Expected Arrival Date of the purchase order on SIA recommended order. Use average of dates as they appear in line detail YYYYMMDD FORMAT. Not double quoted. COMMENT Comment for Purchase order header. Default to null for now. REFERENCE Contains the name of the user creating the order as it appears in the summary on the Order schedule. RECTYPE Character indicating the Purchase order Detail Line. Default to a 2. PORLREV Place holder. Default to 0. Not double quoted. ITEMNO The product code of the item being ordered. LOCATION Warehouse / branch code (not description) as displayed in the PO summary. ORDERUNIT The purchasing unit of measure. Default to SIA unit of measure if not available. OQORDERED Amended quantity ordered on SIA recommended order divided by the Purchase Factor, and rounded to MOQ, if greater than 0, else multiply by 1. Express in terms of the “PURCHASE UNIT OF MEASURE”. Not double quoted. UNITCOST Amended unit cost on SIA recommended order multiplied by the Purchase Factor if greater than 0, else multiply by 1. Not double quoted. EXPARRIVAL Format YYYYMMDD. Not double quoted. RECTYPE Character indicating the Purchase order comment Line. Default to a 3. PORCREV Place holder. Default to 0. Not double quoted. PORCSEC Default to a 0. Not double quoted. COMMENTTYP Default to a 1. Not double quoted. COMMENT Comments entered against the recommended order in SIA Order schedule. "1",0,20121123,"1400",20121225,"comment for PO...","Purchase Name: Francis Lau"
"3",0,0,0,1,"Comment is 80 char long for line above"
"1",0,20121123,"1400",20121225,"comment for PO...","Purchase Name: Buyer2"